Meet the CROSSNET founders, Michael, Chris, and Greg; three ambitious entrepreneurs from the quiet corner of Connecticut. After graduating college they quickly realized they did not want to work a corporate 9-5. 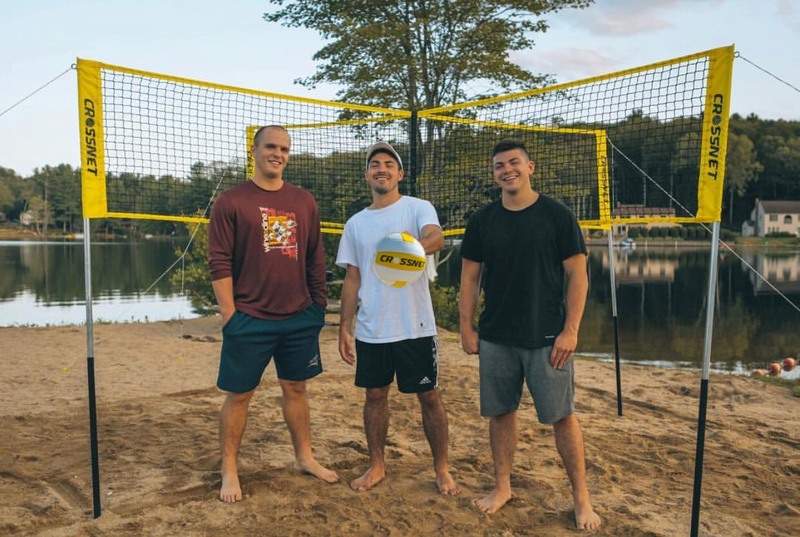 One night they were brainstorming on their couch in the farmlands of Connecticut and dreamed up the world’s first four way volleyball game. Three months later they moved to Miami to make it a reality. City where you’re from: Woodstock and Pomfret, CT. Currently residing in Miami Beach, FL. Tell us about CROSSNET. How did you come up with this idea? Michael Delpapa: The day after my college graduation, I was back in my hometown and made plans with my friend Greg to brainstorm business ideas. Greg had started multiple successful e-commerce businesses with his brother Chris and I wanted to work with him. That night Greg noted the need for more high quality beach and backyard games. Growing up we always played four square on the ground and I asked Greg what he thought about four square volleyball. This is a childhood game that you guys put a spin on? Christopher Meade: Yes, exactly! So if you are familiar with the childhood recess game called four-square, we took that concept and added a volleyball spin to it. There are four squares and everyone plays against each other until someone messes up. The remaining three players then rotate clockwise. The player who messes up goes back to the one square or the back of the line depending on how many people you are playing with. The objective is to be in the fourth square – the only square you can serve and score from. You play to 11 and win by two. How have you been able to grow the business? Gregory Meade: Growing our business has been a lengthy process. First we arranged a meeting with a patent attorney and found out there was a patent on the product idea. We cold-called the patent holder and he agreed to meet us in his home in San Diego. After negotiating, we obtained rights to the patent and started to design and manufacture the game, create rules, test and receive feedback, and then make the proper adjustments. This entire process has taken well over a year. We’ve been busy creating viral videos that are used on Facebook and Instagram in order to grow our organic presence when we are not actively promoting on the beaches of Florida. You can see one here. We have been running with those for the most part, as well as reaching out to almost every school system in the United States. We already have promising relationships with distributors in North America and Canada, and we plan to expand outside of the United States in Q3. What are some secrets in your most successful on those Facebook ads? Christopher Meade: Invest in original content. If the content isn’t authentic and eye grabbing, you will lose 100% of the time. Our goal is to make the customer watch for more than 30 seconds and then take an action. We are fortunate that CROSSNET is the first of its kind and a real head turner, but instructional content is typically needed to explain what they are seeing. Teach us something we don’t know about social media ads. Gregory Meade: You really need to run a lot of tests, you are not going to get it overnight, so don’t give up. With a product like ours, we have found geo-targeting to be the most important aspect. We can not be wasting ad spend targeting people in Alaska during the middle of April. The majority of our ad spend should be spent towards customers who can make an immediate purchase, such as beachgoers in San Diego or down here in Miami. What has been the hardest part so far in your venture? Christopher Meade: Creating the physical game has been by far the most difficult part. Every time we would get a sample, we would head to the beach and get feedback from hundreds of people. Then, we would send back our improvements and sketches and receive a new sample a month later. Rinse and repeat, this has been our life over the past twelve months. Our goal was to discover and correct every flaw, in order to give our customers the perfect CROSSNET experience. It has been a very lengthy production process, but we are finally at a point where we are extremely satisfied with our product. Just like in art and music, you are always going to look back and find something which you could improve on something but eventually you just need to release it and get it into the world. What do you think the three of you do better than most people? Michael Delpapa: Our individual skills complement each other and we each bring different aspects to the team. Greg has grown multiple e-commerce businesses from product idea to functional business with his digital marketing skills. Chris is experienced in getting products into retail and organizations like schools with his experience as an accounts executive at Uber Eats. I work as a mechanical draftsman and was able to design and make engineering drawings for our manufactures. We took our time experimenting with many different CROSSNET samples to bring to the market a high-quality net system. Is your game just for the beach? Gregory Meade: Absolutely not! We actually have two models, an outdoor and indoor. Our outdoor model is supported by plastic pegs (like setting up a tent) so you can play CROSSNET on the grass and sand. We wanted to make sure that we didn’t limit the game to just beachgoers and that you could play almost anywhere. Fun fact: When we were living in Connecticut and got one of our first CROSSNET models we actually played during a snowstorm. It was one of the best times we’ve had playing the game! Our indoor model will be coming out later this year which is geared towards black tops, tailgates, and most importantly for gyms and schools to use. What is the one question you guys get asked the most? Michael Delpapa: “How do you play?” People ask that pretty much every time we have it set up at the beach. As soon as we set up the net, people will begin eyeing it and then eventually somebody will come over, start a conversation and bring their friends over to play. We explain the rules, they play and end of loving it. Honestly, it has been a great way to meet friends, especially when you are new to a city like Miami Beach! Where do you see CROSSNET in a couple years? Christopher Meade: We see it being a global product. Our goal is for CROSSNET to eventually be played on every major beach, host tournaments across the world, be sold in retail stores, and for schools to incorporate our game into their physical education curriculum. Honestly, who did not love gym class growing up? How cool would it be to say we added a new game to gym class. To check out CROSSNET, visit crossnetgame.com.